MOSCOW, May 17. /TASS/. The top ten of the national football teams remained unchanged from April in the new monthly rating list of the world’s governing football body, FIFA, published on Thursday. "Just seven international "A" matches, all friendlies, took place in the past month and, as a result, there are few movers in the latest FIFA… World Ranking," the FIFA said in its statement. "Most of the top 50 is unchanged, with Germany, Brazil and Belgium still the leading trio at the summit of the same top ten as last month," the statement added. 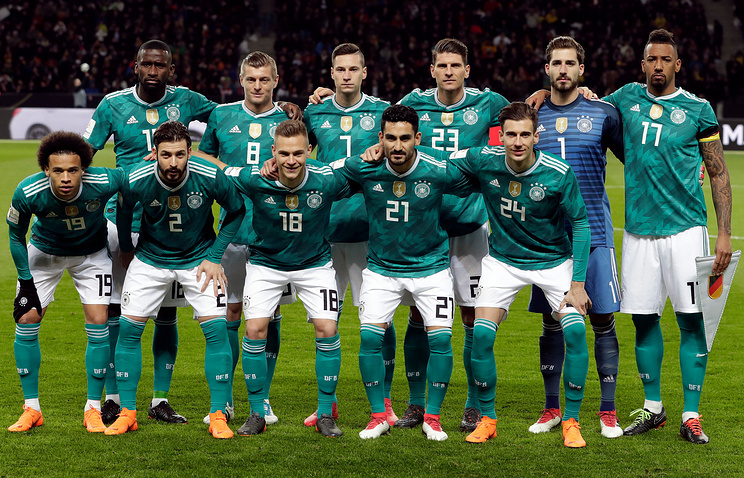 The current frontrunners in FIFA’s top-ten rankings are reigning World Champions Germany (1,544 points), followed by Brazil (1,384), Belgium (1,346), Portugal (1,306), Argentina (1,254), Switzerland (1,179), France (1,166), Spain (1,162), Chile (1,146) and Poland (1,128). Russia, which will be hosting the FIFA World Cup this year, did not play friendly matches either in April or in May and remained its last month’s 66th place packing 493 points. "In fact, the first 47 positions remain totally unchanged from April’s ranking, but outside the top 50, a couple of teams have made notable advances. Kuwait (160th, up 16) have leapt up the table thanks in part to their 2-0 friendly victory over Palestine," FIFA’s statement added. The next edition of FIFA’s ranking list is due to be published on June 7, 2018. The 2018 FIFA World Cup kicks off in 28 days with the opening match in the Russian capital of Moscow.